Written by Catherine Saxelby on Friday, 26 April 2013. 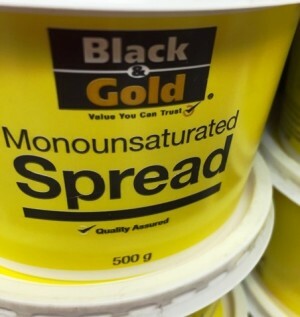 A. Monounsaturated fats have only one double bond in their carbon chain (hence the term "mono"), while polyunsaturated have two, three or more of these bonds ("poly" means many). Understanding this difference in their structure will help us understand the role they have in our health. A common monounsaturated fatty acid is oleic acid found in olive oil. With the formula C18H34O2, it has 18 carbons in its chain and one double bond after the ninth carbon from the methyl (CH3) end.It is shortened to 18:1. Another common one is palmitoleic acid (16:1) found in many animal and vegetables fats. Monounsaturated fatty acids are liquids at room temperature. Monounsaturated fatty acids have a higher melting point than polyunsaturated fatty acids but a lower melting point than saturated fatty acids (which have no double bonds). Monounsaturates are found in all fats and oils but are concentrated in these oils - olive, canola, macadamia, peanut and high-oleic sunflower oil (a type of sunflower oil bred to have a high concentration – it's used to deep-fry potato chips to give them a healthier fat profile). Read more about high-oleic sunflower oil here. They're also the major fatty acid of olives, avocados and many nuts (notably pistachio, almonds, hazelnuts, macadamia, cashew, pecan, peanuts) as well as lean meats, chicken, eggs and fish. And they're in margarines made from olive or canola oil. Monounsaturates reduce levels of the harmful LDL-cholesterol in the blood, although not as effectively as the polyunsaturates. But, they tend to be more stable and less likely to oxidise which has given them the edge for some researchers. Certainly using mono fats to replace saturated fat say olive oil for dripping is a good move I say. The Mediterranean diet is high in monounsaturates from olive oil which is thought to be one of the factors responsible for the low rate of heart disease in Italy, Greece, Crete and Spain. Some research has also suggested that a diet high in monounsaturated fat may be a healthier alternative to a conventional lower-fat, high carbohydrate diet in people with type 2 diabetes or insulin resistance. The richest sources of monounsaturated fats are olive oil, almond oil, macadamia oil and nuts, canola oil, hazelnuts, peanut oil, pecans, rice bran oil, palm oil, cashews, pistachios, high-oleic potato crisps, pine nuts, tahini and sesame seeds, Brazils, avocado and olives. So you can see that nuts and seeds in one form or another are key foods for monunsaturates. Here are my top 20 foods richest in monounsaturated fat in descending order, approx. values in % or grams per 100 grams. Q: What are Hi-Oleic peanuts? Q: What is Hi-oleic sunflower oil? Q. How can a product be labelled “cholesterol free” if it’s high in fat?